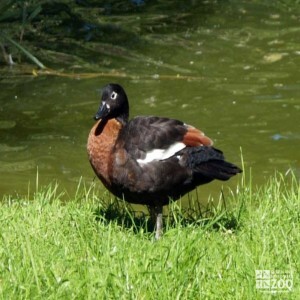 Both sexes of the Australian Shelduck are large, blackish ducks with a reddish-chestnut breast and white wing coverts. The female is slightly smaller with white eye-patches; the male shows a white neck ring. Underparts are black on both sexes. The bill, legs and feet are blackish or dark grey; their irises are brown. The youngsters have extensive brown feathering on the head and neck, no neck ring, some whitish feathering between eye and bill. The range of the Australian Shelduck is Western and Southeastern Australia. Australian Shelducks inhabit freshwater swamps, brackish and freshwater lakes and inshore coastal islands with scattered trees. Gestation takes 30 to 35 days. Australian shelducks are usually found in long-term pair-bonds or family parties. Outside of breeding season, they congregate in flocks of up to 1000. They spend the morning resting and fly to their feeding grounds in late afternoon. They are generally rather wary and unapproachable, flying excitedly to safe waters when disturbed. In flight they form long V-like skeins. On land its stance is erect and on water it floats very high; a strong walter and good swimmer. They sometimes graze in fields. They are highly vocal in flight and while grounded. The male's call is a low, goose-like honk, the female's markedly higher in pitch. The breeding season depends on availability of food and water. Australian shelduck nests are situated in hollow trees or cavities and holes in banks or cliffs. Sometimes rabbit burrows will be used. Only the female incubates the brood and the males returns to his territory. After hatching the female leads the young back to the male's territory where the family is reunited. It is believed these ducks are monogamous.